Elevan people have been killed and 10 others injured after a car bomb exploded at a shopping mall in Somalia's capital. Police said they believe the attack was probably carried out by Islamist group al Shabaab. 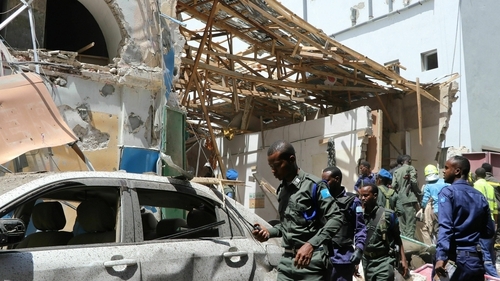 The blast happened in Mogadishu's Hamarweyne district, a busy area with shops and restaurants. Al Shabaab's militants also carry out attacks outside Somalia. Its latest assault in neighbouring Kenya, a suicide andgun attack at an office and hotel complex in the capital Nairobi last month, killed 21 people. Al Shabaab want Kenya to withdraw its troops from Somalia where they are stationed as part of an African peace keeping force which helps defend the central government.